Stunning brown satin soft clutch bag with a feature tortoise & gold frame by Menbur, Spain. 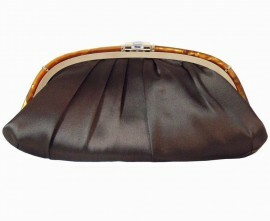 The clutch bag has a beautiful clear gem encrusted fastening. Gold chain enclosed. 30cm x 14cm.